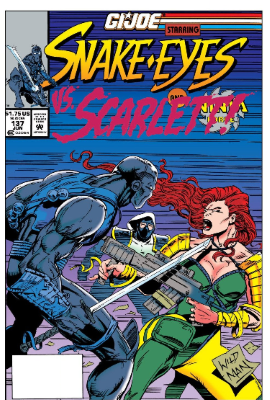 When last we left off Scarlett, and weapons designer Doctor Biggles Jones had just agreed to join Cobra. My mouth dropped a bit in reading the most recent issue of GI Joe so I thought I'd share with you 4 pages from that issue, and 7 from the preceding one. That cover is funny, it's symbolic nothing even close to that happens, but it's funny. 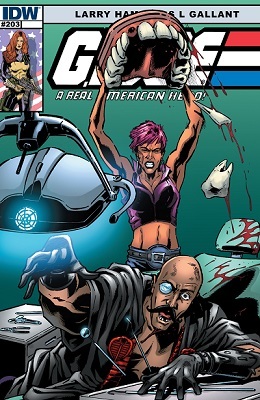 Following their failed and disastrous attempt to take the Pit, Cobra is slithering underground, the Crimson Guards are resuming their original mission of infiltrating American life and manipulating the system from the inside... but before Cobra Commander switches to stealthier tactics there's a loose end to take care of. 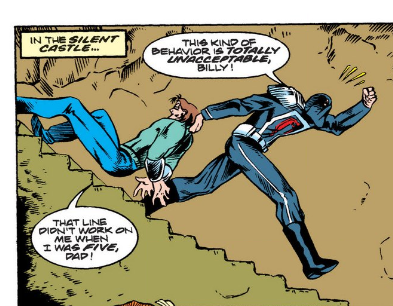 A loose end named Destro. 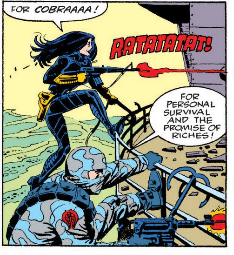 During the run of Marvel's GI Joe, you were on very rare occasions shown what was under some of the most famous masks in the Hama-verse. I'm going to share with you today the real faces of Storm Shadow, Zartan, Destro, Cobra Commander, and Snake-Eyes. With only a handful of specials and a run of Hamlet to occupy his time this year, it looks David Tennant is grabbing himself some face time in the prequels to the forthcoming GI Joe movie.